Information Processing: CBO Against Piketty? 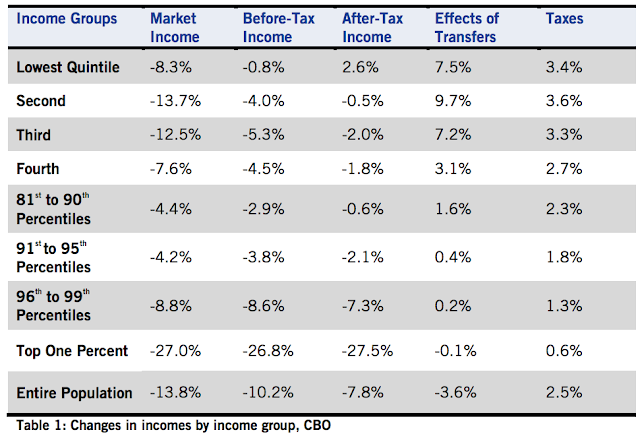 This report using CBO (Congressional Budget Office) data claims that income inequality did not widen during the Great Recession (table above compares 2007 to 2011). After government transfer payments (taxes, entitlements, etc.) 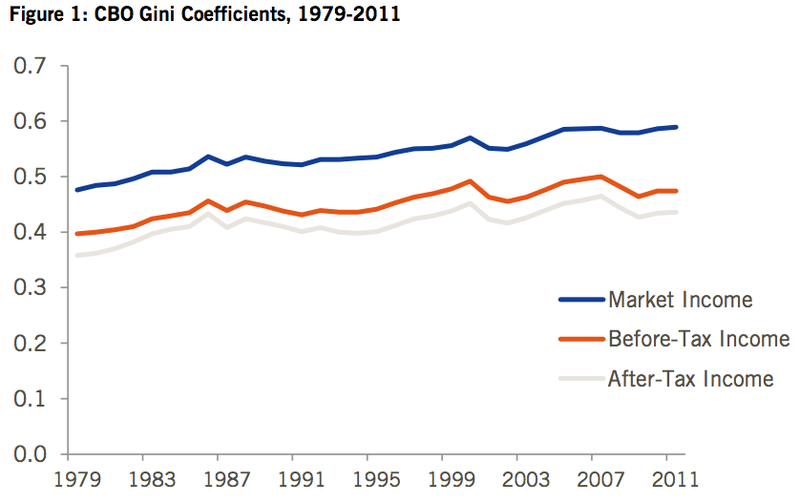 are taken into account, one finds that low income groups were cushioned, while high earners saw significant declines in income. 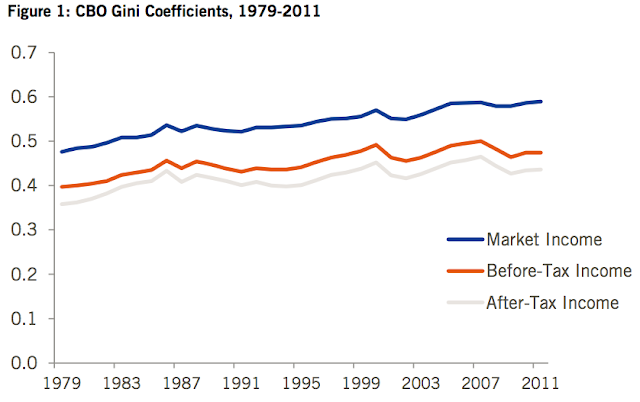 Consequently, both methodologies reveal a real income inequality problem.15 But this paper once again shows that the IRS data give a misleading impression of what has happened with income inequality (not growing as fast in the period from 1979 to 2007 and decreasing, not increasing in the years after 2007). While many on the left were unhappy with the first ITIF paper and my earlier work criticizing Piketty and Saez, it is less clear how they will react to this paper.16 On the one hand, the paper argues that inequality doesn’t always rise and that it didn’t since the onset of the Great Recession. On the other hand, it argues for the efficacy of robust income-support and growth policies and ultimately provides a refutation to a critique that Republicans have made of President Obama. See also Piketty on Capital and Piketty's Capital. Piketty's book is more concerned about the concentration of patrimony/net assets/wealth than on the concentration of income on any given year, in fact ( at least in the original french edition) he argues extensively against the validity of using gini coefficients. Piketty's conclusions of increasing wealth concentration in the US since the 1970's are also corroborated by other sources, in Wolff, Edward N. (2012). "The asset price meltdown and the wealth of the middle class " the author estimates that the share of total wealth in the US held by the top 1% of households went from around 20% in 1979 to around 35% in 2010. Allowing medical price inflation to count as decreasing income inequality, as this study does, is a ridiculous procedure.